ProtonVPN comes with the brand name of ProtonMail. Since ProtonMail is the most popular option for secure email service, there are big expectations for ProtonVPN. It is headquartered in Switzerland, which doesn't have strict data retention laws, making ProtonVPN a good choice for privacy. With apps for virtually all computers and smartphones, ProtonVPN makes it easy for anyone to go anonymous. It supports peer-to-peer networking, which means it has the technology to download (torrent) the movies and games of your choice. And since it delivers high speeds, you can stream HD videos without any issues. 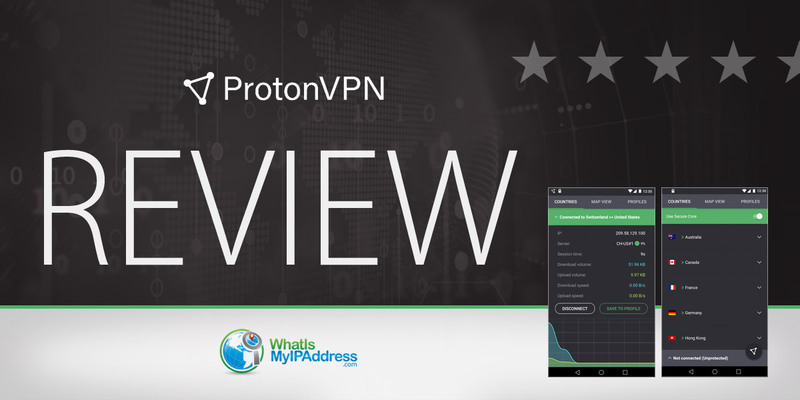 ProtonVPN offers several exciting features, and the best one would be its free plan. That's right—you can use their VPN for free...with some limitations, which is understandable. While the free plan gives you access to servers in just three countries and doesn't offer very high speeds, it will likely cover your basic needs. For more expanded services, you'll need to switch to one of their paid plans. Nonetheless, PC Magazine rates ProtonVPN as the best free VPN available, based on its security focus. ProtonVPN has a number of special security features, such as a kill switch and DNS leak protection. They have two payment options—credit cards and PayPal. If you are privacy conscious, you can pay through Bitcoin, but it's not a quick process. You can buy a subscription by first opening a ProtonMail account—it will take a few days, but it will work. ProtonVPN offers high-speed connections that make gaming and streaming a breeze. While this VPN has several great features, their customer support can be a bit disappointing, because they don't have a live chat option. Most top VPN companies offer live chat support. And since this VPN comes with a familiar brand name, it's natural to expect the best support. However, ProtonVPN doesn't offer live chat. You can email them or open a support ticket and then wait for their reply. However, it's not all bad. They have several guides and helpful tips in their knowledge base. So, if you need any help, you can just visit their website and get help on the problem you're facing. But sometimes, there are issues that need help from customer support. For example, what if you paid your invoice, but your billing cycle isn't updated? You'd need to contact support for that. And you'll need to wait for a few hours to even a day. But when you get a reply, it will generally be accurate and will solve your issues. They are also available on social media channels such as Facebook and Twitter; but they will generally ask you to open a ticket for your case—so it might simply be easier to just open a ticket in the first place. ProtonVPN has four plans, and one of them is free, which is an option for some VPN users. If you want just basic VPN services, you can try the free plan. It allows you to connect to servers in three countries and the speeds are decent enough. For a full-VPN experience, you should move to one of their paid plans. There are three: Basic, Plus, and Visionary. There's a 30-day money-back guarantee on all of them. The basic plan is low-priced and allows you to access the entire network of ProtonVPN. You can connect two devices on one subscription and get high speeds. The Plus plan is more than Basic but, still generally less expensive than other VPNs. It lets you connect up to five devices on a subscription and gives you access to their secure core server and Tor servers. But if you want the best ProtonVPN has to offer, you can choose their Visionary plan. It's costs a bit more, but it lets you connect up to 10 devices on a single subscription. It also includes a ProtonMail Visionary account. ProtonVPN has apps for Windows, Mac, iOS, Android, and Linux. The interface of the app is clean and user-friendly. The app itself is very easy to use and connects quickly to the VPN. Installing the app is very easy. For Windows, Mac, and Linux, you can download the installation files from their website. For iOS and Android, you can search for their app on the app store and install it on your phone. The app lets you pick a location of your choice and connect to a server on that location. This helps you hide behind the IP address location of your choice. You can upload and download torrents on ProtonVPN and the speeds are very fast. The app comes with a kill switch that keeps you protected if your VPN connection drop were to drop. This is a feature your VPN should have if you value your privacy. Also, their DNS leak protection makes sure you stay anonymous and no part of your traffic goes outside the secure tunnel. Overall, their privacy offering seem have your privacy concerns in mind. Also, because ProtonVPN is headquartered in Switzerland, it's a secure option for privacy-minded users. Why? Because the government itself has high privacy standards and Switzerland is not subject to Internet-usage investigations from other countries. If you want complete privacy, you can get the Visionary plan that includes a ProtonMail account as well. This will make sure your presence on the internet is completely hidden. With its OpenVPN protocol and AES 256-bit encryption, ProtonVPN offers strong security. And this is exactly what you'd expect from the creators of ProtonMail, which makes a highly secure, encrypted emailing system. ProtonVPN is a no-logs VPN that helps you stay anonymous. They don't keep any logs regarding your IP address, the server you connect to, the web pages you visit...none of it. They offer a free plan for low-volume users and affordable plans for those who want more. For example, their basic package lets you unblock geo-restricted content and stream videos at high speeds for only a few dollars per month. While everything about this VPN is great, they lack a bit in customer support. They have a good knowledge base and more, but there's no live chat. Which means if run into a problem, you'll need to wait until you get a reply to your ticket. ProtonVPN delivers a solid VPN experience and it designed to help you stay protected and anonymous on the internet.